The definitive Torah guide to animal suffering, a subject front and center today due to the unprecedented suffering of animals brought about by modern industrial farming. Painstakingly researched and compiled with great erudition and clarity by the foremost scholar on the subject, Asa Keisar, this seminal work leaves no room for doubt as to the Torah’s response to the new reality of factory raised animals. Velifnei Iver Hashalem, studied by tens of thousands of yeshiva students throughout Israel each year, also includes the lesser studied subject of the Torah’s position on meat and why we are allowed to eat it at all. 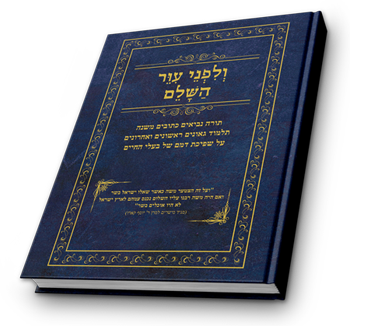 This gorgeous, exquisitely crafted, unique sefer makes a handsome addition to any library and is offered as a very special gift for a limited time to our supporters.